Not to be confused with Robert Gould. Robert Paul "Robbie" Gould III (/ˈɡoʊld/; born December 6, 1981) is an American football placekicker for the New York Giants of the National Football League (NFL). He played with the Chicago Bears from 2005 to 2015, during which he became the franchise's all-time leading scorer. Gould was originally signed by the New England Patriots as an undrafted free agent in 2005. He played college football at Penn State. He is the ninth-most accurate kicker in NFL history. Gould was born to Cheryl and Robert Gould in Jersey Shore, Pennsylvania. His father was a three-time All-American soccer player who led Lock Haven University to a Division II national championship in 1980. and was drafted by the St. Louis Steamers in the early 80s. He attended Central Mountain High School in Mill Hall, Pennsylvania, where he won letters in football, soccer, basketball, and track. During the 2000 Boys' Soccer District Championship, he scored the game-winning goal with seconds left. Gould enrolled in Penn State University, where he played for the Penn State Nittany Lions football team. Although originally interested in professional soccer, he eventually chose football and asked his high school principal to send a letter of recommendation to Penn State head football coach Joe Paterno, who invited him to try out as a freshman walk-on. After going undrafted in the 2005 NFL Draft, the defending Super Bowl champion New England Patriots signed Gould prior to the 2005 NFL preseason even though they already had established Super Bowl-winning kicker Adam Vinatieri. Following his expected preseason release from the Patriots, Gould signed with the Baltimore Ravens only to be waived three weeks later. He then took a sabbatical from football, working construction for M&R Contracting in Mill Hall, Pennsylvania. The Bears signed him on October 8, 2005, following the Week 3 injury of their starting kicker, Doug Brien. Gould kicked his first NFL field goal the next week in a 20–10 loss at Cleveland, and his first game-winner in Week 9 against the New Orleans Saints, finishing the 2005 season with a 77% field goal percentage and hitting all but one of his 20 PAT attempts. 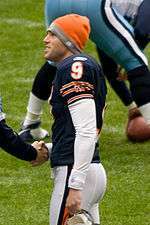 He kicked 26 consecutive field goals during the 2006 NFL season, breaking former Bears’ kicker Kevin Butler’s record of most consecutive field goals and winning NFL Special Teams Player of the Month for October 2006 in the process. 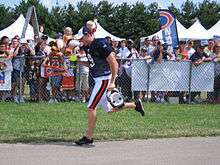 In addition, NFL fans across the nation voted Gould the NFC’s kicker for the 2007 Pro Bowl. He was also named to the 2006 All-Pro team by the Associated Press. His 25-yard overtime field goal against the Tampa Bay Buccaneers gave the Bears home field advantage throughout the ensuing playoffs. On January 14, 2007, his 49-yard field goal in overtime against the Seattle Seahawks gave the Bears their first divisional playoff win since 1988, advancing them to the NFC Championship game, which they won but then lost Super Bowl XLI to Peyton Manning and the Indianapolis Colts. 29–17. The following season, Gould was named NFC special teams player of the month for December 2008 after making all eight of his field goal attempts including two more overtime game-winners, becoming the fourth kicker of overtime game-winning field goals in back-to-back games in NFL history. He converted 26 of 29 field-goal attempts (89.7 percent) in 2008, breaking his own franchise single-season record for accuracy. Going into the 2009 season, he had converted 84.8 of his career field goal attempts. He has missed three extra point attempts in his NFL career. On May 12, 2008, he signed a five-year extension with the Bears that would keep him on the team through the 2013 season. The contract, reportedly worth $15.5 million, included a $4.25 million signing bonus and made Gould the NFL's highest-paid kicker. Gould made his tenth career game-winning field goal against the Carolina Panthers in Week 8 of 2012, and his ten consecutive field goals from 50 yards or more without a miss was second behind Tony Zendejas. Before pregame warm-ups Week 14 of 2012 against the Minnesota Vikings, Gould strained his left calf. After limited play during the game, Gould was placed on injured reserve for the remainder of the 2012 season. In Week 1 of 2013 against the Cincinnati Bengals, Gould made a 58-yard field goal late in the first half, setting the Bears record for longest field goal and tying him with Zendejas for most consecutive 50+-yard field goals without a miss with eleven. In Week 13 against the Minnesota Vikings, Gould missed a career-high two field goals, tying his two missed kicks in 2006 against the St. Louis Rams; the two field goals were a 66-yarder, which would have broken the NFL record for longest field goal converted, and a 47-yarder in overtime. On December 27, Gould signed a four-year extension with the Bears worth $15 million, with $9 million guaranteed, the most by a kicker. Gould ended the 2013 season converting 26 of 29 field goal attempts and 45 of 46 extra points for a total of 123 points scored. Gould also became the second player in Bears history to record 1,000 points, with 1,025, 91 points behind Kevin Butler. Gould's seven seasons with at least 100 points is a Chicago Bears record. In Week 5 of 2015 against the Kansas City Chiefs, Gould became the Bears' all-time scoring leader with 1,118 points, overtaking Kevin Butler's record by two, with a 30-yard field goal in the third quarter. At the end of the season, Gould made 33 field goals for this season, the most ever for a Bears kicker in a single season. In 2016, Gould was awarded the Ed Block Courage Award. Gould was released by the Bears on September 4, 2016, just one week before their first regular season game of the 2016 season. Gould, the longest-tenured player for the Bears, ended his career in Chicago as the team's all-time leader in career points (1,207), field goals made (276), and career field goals of at least 50 yards (23). In the wake of Josh Brown's domestic abuse investigation, Gould was signed by the New York Giants on October 20, 2016. Gould took the number 5 because Giants' punter Brad Wing already had the number 9. On October 23, 2016, Gould kicked his first field goal as a Giant against the Los Angeles Rams. On November 20, 2016, Gould kicked a 46-yard field goal but missed two extra point attempts against his former team, the Chicago Bears. Despite the difference in spelling, his surname ("Gould") uses the same pronunciation as the element (gold): "gōld". This has prompted some announcers to dub him "Robbie Gould is gold", "Solid Gould" or "Good as Gould" upon his successful field goal attempts. His younger brother, Chris Gould, was a kicker for the University of Virginia, and in the Arena Football League and is currently a special teams quality control coach for the Denver Broncos. The two also have a cousin, Brandon Thomas Gould, who played on the offensive line for Bethune-Cookman University. On December 1, 2013, Gould's wife Lauren gave birth to their first child, a son. ↑ "CSTV.com: #1 in College Sports". Virginiasports.cstv.com. Retrieved 2012-07-21. ↑ "Scout.com: Gould Getting a Leg Up". Story.scout.com. 2007-01-22. Retrieved 2012-07-21. ↑ Mayer, Larry (2006-12-20). "Bears Pro Bowlers traversed different path to NFL". Chicago Bears. Archived from the original on 2012-03-24. Retrieved 2012-09-05. ↑ Archived December 13, 2006, at the Wayback Machine. ↑ "Grossman stays hot in leading Bears to win". Chicago Bears. 2006-12-18. Archived from the original on 2012-02-05. Retrieved 2012-07-21. ↑ chicagotribune.com (2008-05-12). "Huddle Up: Gould's Five year extension makes him highest paid kicker". blogs.chicagosports.chicagotribune.com. Retrieved 2009-09-23. ↑ espn.com (2008-05-12). "Year after Pro Bowl season, Bears sign kicker Gould to five-year extension". espn.com. Retrieved 2008-05-12. ↑ Seligman, Andrew (2008-05-12). "Bears make Robbie Gould NFL's highest-paid kicker". The Mercury News. Retrieved 2008-05-12. ↑ Mayer, Larry (2012-12-11). "Gould among three Bears played on injured reserve". Chicago Bears. Retrieved 2012-12-11. ↑ "Bears' Gould out for season". Yahoo! Sports. 2012-12-11. Retrieved 2012-12-11. ↑ Mayer, Larry (2013-09-08). "Bears vs. Benagsl game blog". Chicago Bears. Retrieved 2013-09-08. ↑ Mayer, Larry (2013-12-03). "How have Bears fared when needing one yard?". Chicago Bears. Retrieved 2013-12-03. ↑ Chase, Chris (2013-12-01). "Marc Trestman blew it for the Chicago Bears, not Robbie Gould". USA Today. Retrieved 2013-12-03. ↑ Rosenthal, Gregg (2013-12-27). "Robbie Gould signs four-year extension with Bears". National Football League. Retrieved 2013-12-29. ↑ "2013 Season Highlights". Chicago Bears. 2014-01-08. Retrieved 2014-01-08. ↑ Mayer, Larry (2014-01-31). "Gould gave Bears leg to stand on". Chicago Bears. Retrieved 2014-01-31. ↑ Mayer, Larry (2013-12-27). "Bears sign Gould to extension". Chicago Bears. Retrieved 2013-12-27. ↑ Wagner-McGough, Sean (October 11, 2015). "Kicker Robbie Gould now holds Bears franchise record for points scored". CBSSports.com. Retrieved October 11, 2015. ↑ "By the Numbers: 2015". www.chicagobears.com. Retrieved 2016-01-07. ↑ Dickerson, Jeff (2016-04-04). "Robbie Gould wins Ed Block Courage Award". ESPN. Retrieved 2016-04-04. ↑ Dickerson, Jeff (September 5, 2016). "Bears sign Connor Barth as new kicker". ESPN. Retrieved September 6, 2016. ↑ Eisen, Michael. "Giants sign kicker Robbie Gould". Giants.com. ↑ The Associated Press (2016-10-23). "Giants Use Four Interceptions to Defeat the Rams in London". The New York Times. ISSN 0362-4331. Retrieved 2016-12-05. ↑ "Robbie Gould hits his first Giants field goal". NFL.com. Retrieved 2016-12-05. ↑ Hubbuch, Bart (2016-11-20). "Why ex-Chicago kicker Gould hadn't seen anything like this wind". New York Post. Retrieved 2016-12-05. 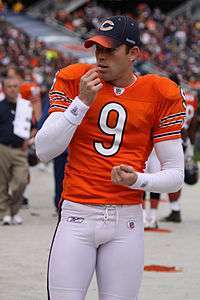 ↑ "Chicago Bears Strike a Gold Mine Signing Robbie Gould through 2013". Bleacher Report. 2008-05-14. Retrieved 2012-07-21. ↑ "Gould celebrates his brother's title win". Chicago Bears. 2016-02-08. Retrieved 2016-02-09. ↑ Campbell, Rich (2013-12-01). "Gould taken on emotional roller-coaster ride". Chicago Tribune. Retrieved 2013-12-02. Wikimedia Commons has media related to Robbie Gould. This article is issued from Wikipedia - version of the 12/5/2016. The text is available under the Creative Commons Attribution/Share Alike but additional terms may apply for the media files.